The Ebola virus had more opportunities to mutate during the West African epidemic than ever before. 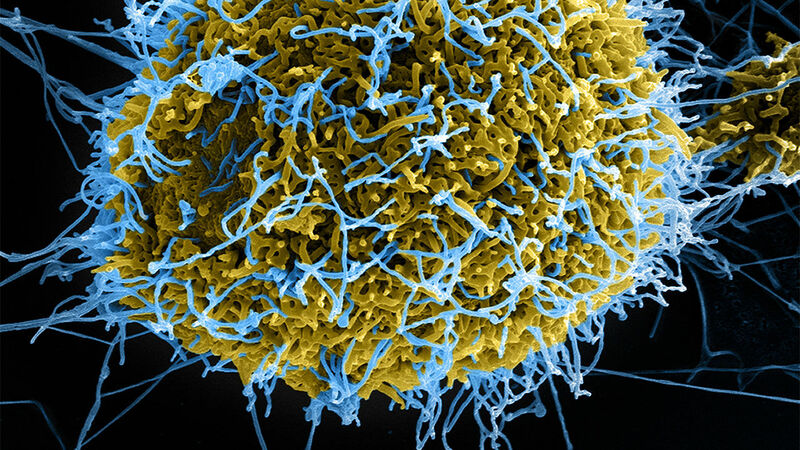 Has a new mutation in the Ebola virus made it deadlier? The sheer size of the Ebola epidemic that began in 2013 and engulfed West Africa is still a bit of a riddle for scientists. Previous Ebola outbreaks had never sickened more than 600 people. But the outbreak in Liberia, Sierra Leone, and Guinea infected more than 28,000 before it was finally brought under control. Part of the explanation was that the virus had suddenly surfaced in major cities, making it harder to stamp out than in the isolated rural locales where it had struck before. The countries’ poor public health infrastructure and other environmental factors played roles as well. But two papers raise another intriguing possibility. They show that some 3 months after the outbreak took off and became a full-blown epidemic, the virus underwent a mutation that made it better suited for humans than for its presumed natural host, a fruit bat species. “The virus has never had this many human-to-human transmissions before, and there are a lot of mutations happening,” says Harvard University’s Pardis Sabeti, an evolutionary geneticist who co-authored one of the papers. The big question, of course, is whether the mutation could help the virus spread. The researchers did not have access to a biosafety level (BSL) 4 laboratory necessary to test that with the real Ebola virus, so they engineered harmless “pseudotyped” viruses that contained the gene for the surface protein in both its ancestral and mutated form. The mutant far more easily infected human immune cells than did the ancestral pseudotype, the team reports today in Cell . The researchers also showed that the mutant more easily infects primate cells than cells from rodents or carnivores. The second paper, published today in Cell by a team led by Jonathan Ball at the United Kingdom’s University of Nottingham and Etienne Simon-Loriere of the Pasteur Institute in Paris, independently arrived at a similar conclusion. The team analyzed its own 1610 sequences from the epidemic and also found that they separated into two lineages based on the single mutation in the glycoprotein. The researchers also compared pseudotyped Ebola viruses that matched the ancestor with ones with the same mutation, and found they preferentially infected cells from humans as opposed to the fruit bat species Hypsignathus monstrosus. They also found this mutant’s infectivity was increased by other mutations, which suggests that the virus didn’t undergo just one, but several adaptations allowing it to jump more easily from human to human. That could have complicated attempts to bring the epidemic to an end. But Ball, Simon-Loriere, and colleagues approach this conclusion most cautiously, stressing that epidemiologic factors, such as “increased circulation in urban areas that in turn led to larger chains of transmission,” likely were the most important driver. “Despite the experimental data provided here, it is impossible to clearly establish whether the adaptive mutations observed were in part responsible for the extended duration of the 2013–16 epidemic,” they write in their paper.